IF YOU SEARCH THE WORD TRANSLATION in word tracker, one of the top results that the engine will spit out is website translation with a rate of 990 searches per month. And this only in English. More and more businesses invest in their online presence with the aim to enter new markets around the world. When it comes to purchasing goods online, international customers want to make sure that they understand what they pay for. So now, more than ever, businesses around the world are in search of good localization partners who can help them make a difference. Having translated myself 4 websites and managed a dozen website localization projects in over 25 languages, I know that this is not an easy endeavour. What helped me keep my cool even in the most stressful times was a good plan. My experience as an agile project manager came in handy when I needed it most. Now I want to share with you some project management practices that will help you deliver great website translations and add a new skill to your CV. The first step in organizing your projects is creating a project portfolio. While there are a plethora of project management tools out there, I recommend that you start with a simple excel sheet. It doesn’t matter in which tool you host your localization project portfolio, as long as you have a single source of truth for all your projects. Manage all your projects and clients in one place. Track the start date/end date and the word-count per project. Add a comments sections for the most important particularities of your project: tonality, proper names that shouldn’t be localized or terminology that needs to be translated in a specific way. Define your project scope, high-level deliverables, and dependencies. After each project, you will have created a standard project plan that you can reuse and extend in future projects. This exercise will help you improve your project management skills and find better ways to track and record your tasks. 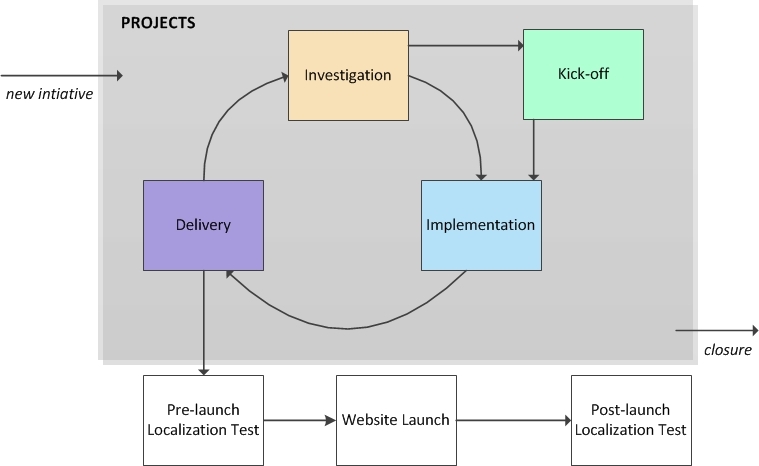 Create a standard project plan for website localization projects. Track your efforts per project in hours or person-days. Websites from one and the same industry tend to have similar content. With the time, the efforts tracking exercise will help you develop techniques for estimating the volumes and efforts of a website localization project prior to translation start. By being organized, having a reusable project plan and being able to estimate volumes and project efforts, you can save up a lot of time. Use that extra time to improve your website localization services for your clients. Great, now that you have a project portfolio, it’s time to take one project from your list and start managing it. Let’s assume that one of your clients approached you with a website localization project: your client wants to launch her new website in one or more international markets and needs your translation services. Website localization is essential for any business who wants to enter a new market, reach a new audience and potentially new customers. The most important aspect of a website localization project is the content. You want to make sure that you translate in the right tonality and use the right language style that will appeal to the target audience of your client. It has to be a language that your market’s segment understands, relates to and associates with the type of product your client is selling. After you found the correct tonality, the next step is to ensure that your writing style captivates and keeps your audiences’ attention. Headlines are especially important, so put extra thought into them. Ultimately, your writing should persuade the readers to open up their wallets and purchase the product or service your client is selling. This is a lot of responsibility and it should not be taken lightly, neither by you nor by your client. A close collaboration is needed to reach this goal. The collaboration with your client begins during the investigation phase of the website translation project. This may sound like I am inviting you to work for Sherlock Holmes and, while you might feel like a detective at times, the investigation step is simply about digging into your client’s requirements before you start with the translation work. What product or service is she selling, what is the brand identity of her product, in which tonality did she decide to address her audience and, last but not least, who is she targeting for her business? This can be easily done with a Localization Kit. Will you work in a tool? If not, how will you receive the source files and in which format? Do you need to use the business’ in-house translation tool? If you yourself work with a translation tool, how will you import your client’s files? A website usually has a limited range of content types: resource strings, FAQs and help texts, legal texts, product-related content, error messages, payments texts, marketing content and perhaps some auto-mailings. Try to find out approximately how much text each content type has and calculate your efforts and ability to deliver on time. Most of these texts can be seen on the website so you can also make your independent calculations of the volumes to compare with your client’s estimations. The scope of your investigation step is to outline your project strategy. Don’t worry if you don’t know everything right from the start. Try to define the 4 points below as best as you can. Any gaps will be filled in during the project. This is called being agile. Define your project scope and insert it in your portfolio in the Project scope column. You shouldn’t write more than a couple of sentences. Identify your deliverables for this project. You do this by breaking down your project into work packages. A work package can include one or more website content types. Don’t worry if you can’t identify every single task from the start. Simply outline the big translation packages and insert them in your project portfolio under the scope as bullet points. What kind of research do you have to make? What kind of terminology glossaries do you have to prepare? What language style will you use? How will you check with your client if your choices are the right ones? This is the most difficult part of project management and it takes a lot of practice to get good at it. So don’t worry if you can’t make accurate estimations from day one. Actually, never try to make accurate estimations! It is called estimation because it is not accurate, but an educated guess based on your experience and the type of website you are localizing. In the beginning, keep your estimations for yourself, write them down and compare them with your actual efforts at the end of the project. Do this simple exercise and you will learn a lot about project management. This is a very beneficial step if you are managing a website translation in more languages. Since more often than not, the translators work from different locations, you will find it very practical to make your project kick-off per e-mail. If you are a one-man-show, I suggest that you do the following: prepare an e-mail for your client where you outline your plan for delivering the website translation project. Outline your dependencies: files that you didn’t receive yet, questions that are still open, etc. During the implementation phase, you can use this e-mail thread to send a couple of status updates of your translation work for the project. You can use the excel list to outline which packages are done, which are in progress and which you haven’t started yet. Like this, your client will always be up to date and able to react in case things don’t go as planned. In this step the magic happens: the creative work of localizing the content. A lot of effort was invested in the project before you could actually start translating the website content. This is the type of work that 99.9% of your clients are not aware of, but which plays a major role in delivering a quality website localization project. Translation work is not about uploading a file, pressing a button and getting back the perfect content that will gain you a brand new audience and earn you a lot of money in a new market. A lot of thought goes into website localization and since the client will not think of all the details, you have to jump in and use your project management skills to offer the best services. Make sure that your client sends you for translation only the resource strings that are active on the website. You will be amazed at how many companies fail to keep their content up to date and end up with loads of antique strings that are not relevant for their page anymore. Try to avoid having the “old load” in your project, as this might confuse you when it comes to terminology and site functionality. It could also delay your delivery date, by increasing your workload. In one project I managed, the product manager had 4,000 resource strings in total but only 1,800 were still active on the website. Check at an early stage in the project if the file format created by your translation or editing tool is compatible with the client’s CMS tool. Have the client check and approve a sample marketing translation early in the project. Ask your client to check with her marketing team if the tonality and language style meet their expectations. If no one in the company speaks the target language, the marketing team can run an A/B test and let you know. Even the best translator cannot produce the right marketing copy for the client’s audience without proper feedback. Your first translation package is done, you tested your file format, made sure the marketing tonality is approved by the client and you are ready to deliver your first translations for the project. Don’t forget to send a status update e-mail to your client and mark the work package as done in your project plan. Repeat steps 1, 3 and 4 until the whole website localization project is done. As already mentioned, you will not get all the source files from the beginning of the project and you will also not receive all the information you need to complete your work. That’s why the investigation, implementation and delivery steps are repeated until all the website content was translated and the website is ready to be launched. This is a very agile way to manage projects and very efficient in dealing with change requests in your project. Keep your scope and project plan up to date and don’t forget to renegotiate delivery timelines and budget in case of big change requests. This is especially true if you realize that the word-count is actually higher than initially estimated. Now you delivered all your translation packages and the texts were published on the website. It’s time for a localization test where you check your translations in context. Step 5 is the most important in website localization, yet it is the most overlooked. Once all the source files are translated and the texts are published on the website, the localization project is normally considered closed. Take from a few hours and up to a day to check all the website thoroughly. Click on every link and trigger every pop-up, and error message. Make screenshots of any errors or content mismatches that you find and send your corrected version, including the screenshots and the page link where you found the error, in a word file to your client. After you’ve sent feedback and your changes were published on the website, it’s time for a second localization test. Check if all the requested changes were implemented and see if you can find any further errors or mismatches. Send your feedback to your client. Many website owners perform a website check only with in-house testers or external testing agencies. The website localization test is part of the website translation process. The texts are not final until they are not checked in the context of the website. So many things could go wrong. A lot of things still happen in the days or weeks before a new website is launched. As it is the case in the majority of projects, there will be delays which will leave time for new content ideas. These are the last minute texts that need to be translated urgently, such as marketing texts. The best website localization work can never make up for floppy marketing content, like teasers and banners. Since these tend to be created last minute, it is a good idea to perform another localization test after the website was launched. Ask your client to include you in the post-launch bug fighting activities. If you have a good client that you would like to keep, offer this service at a per hour rate or even free of charge if you managed to negotiate a good price for your project. It will take only some hours of your time, but it will go a long way in keeping your customer happy and coming back with more translation work. Project management is a great skill that will help you tremendously as a professional in the translation industry. But don’t forget that it is ultimately only a tool, just like a CAT tool. Ultimately, the main goal of the translation and localization services it to deliver good quality content. Read more about should go in your Localization Kit here. If you’re looking for a good project management tool to organize your tasks, I recommend Kanban flow. It’s free, easy to learn and has the added advantage that it teaches you project management with the agile method Kaban.